I just visited Philadelphia for work and never made it to the climbing gym at night to de-stress, shame on me! 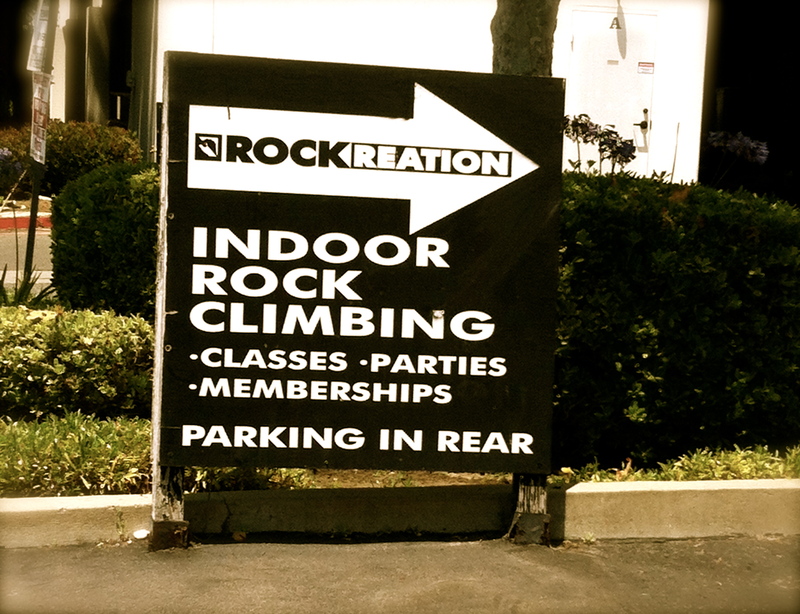 This week I was in Southern California for vacation and was determined to get some various forms of climbing in, so I paid Rockreation a visit. 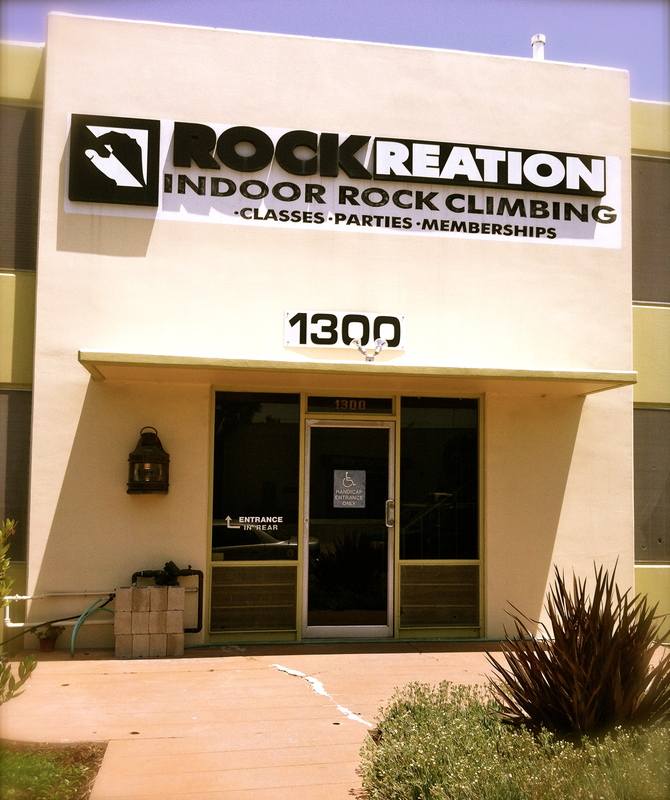 Rockreation has 3 locations, Costa Mesa & Los Angeles in California and Salt Lake City, Utah. I visited the Costa Mesa location because it is only about 30 minutes from San Clemente. So if you are on vacation at one of those cute nearby beach towns (e.g., Laguna Beach, Dana Point, etc. 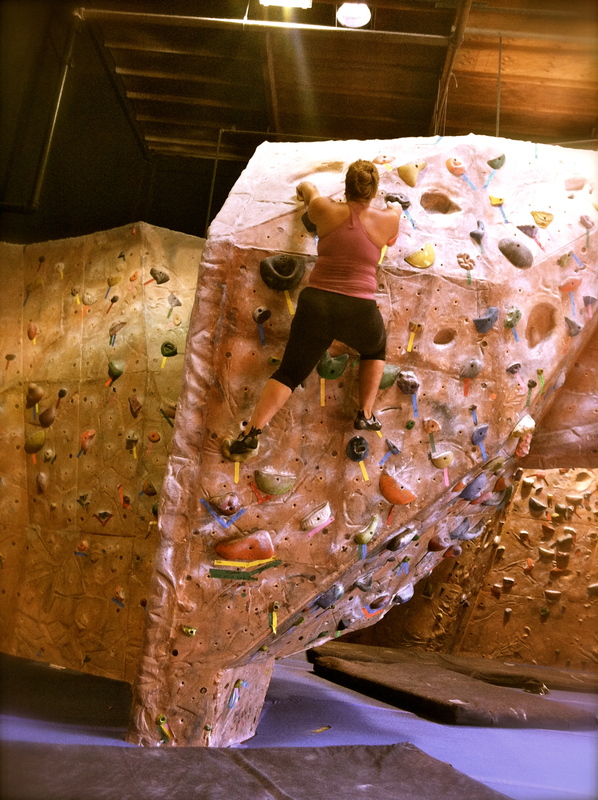 ), & just want a quick indoor climbing workout, make sure you visit this gym! Hours of Operation – The gym has a good schedule. Noon until 10 pm (Monday through Thursday), Noon until 9 pm (Friday), and 10 am until 6 pm (Saturday & Sunday), but always check their site just in case. Getting There – Like I said, it is about 30 minutes (I do have a Yankee lead foot) and to avoid tolls it’s a simple I5 to I405 ride, the gym is not even 1-2 miles of the freeway exit. Just remember, parking and entrance is in the rear of the facility. Cost – The day pass costs $16. The gym rental package is $5 ($7 non-members) and includes everything less chalk. The deluxe gear package rental that includes chalk at $6 ($8 for non-members). 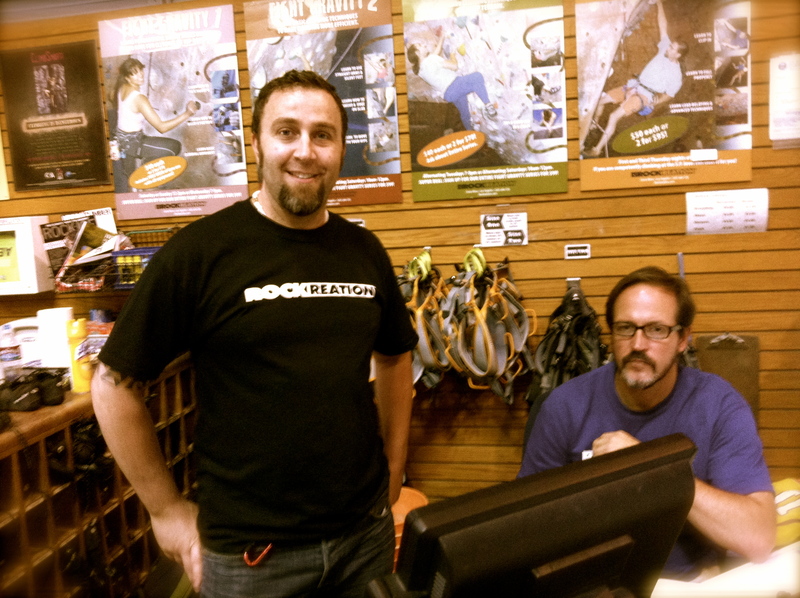 The super duper friendly staff at Rockreation! 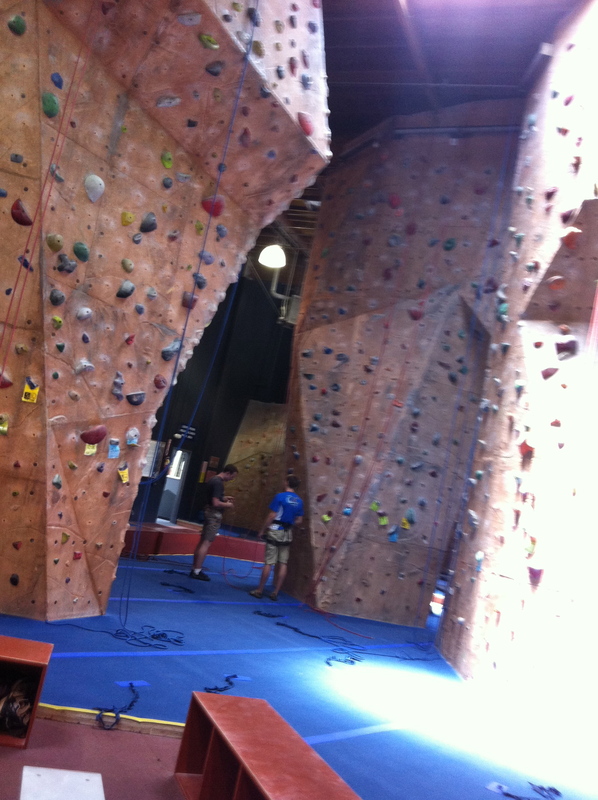 Facility – The gym is about 12,000 square feet and equipped with tons of lead, top rope and bouldering routes. The height of the lead and top rope routes are just at or under 30 feet (the regulations were more strict when ths gym was built over 17 years ago!). There is a great variety of routes from slab, crack, vertical, slightly overhung to Jesus you in a cave its nice and overhung! There is also a workout gym area with a variety of equipment and this gym has yoga three times per week, be sure to call and check in on that schedule if you are interested in a climbing & yoga workout. The bathrooms are roomy, clean, equipped with showers and lockers. Staff – I met Devin, the gym manager, and I swear he is one of the most welcoming staff members! He not only took the time to make sure I knew the ins and outs of the gym, I observed him welcome everyone in that gym with such great energy. There was route setting going on when I was there and the staff was extremely helpful and friendly. Belay testing – If you pass the lead belay test, it also covers the top rope belay test. Otherwise, testing for top rope only is available too. 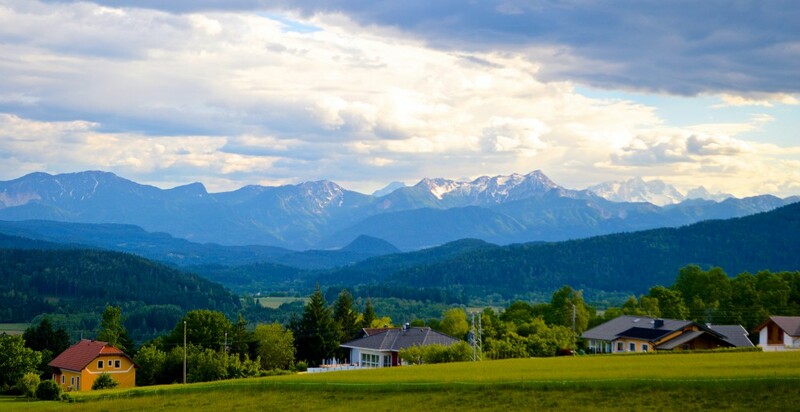 No reservations are required and there is no cost. This gym is safety conscious (KUDOS!) and it will be important you have a dedicated brake hand (yes we should all know this, but you would be surprised…). No GRIGRI – Locking devices are not allowed, you will have to know how to manually belay utilizing an ATC. Lead Ropes – The gym does not provide lead ropes, if you plan on sport leading you will need to bring your own rope. 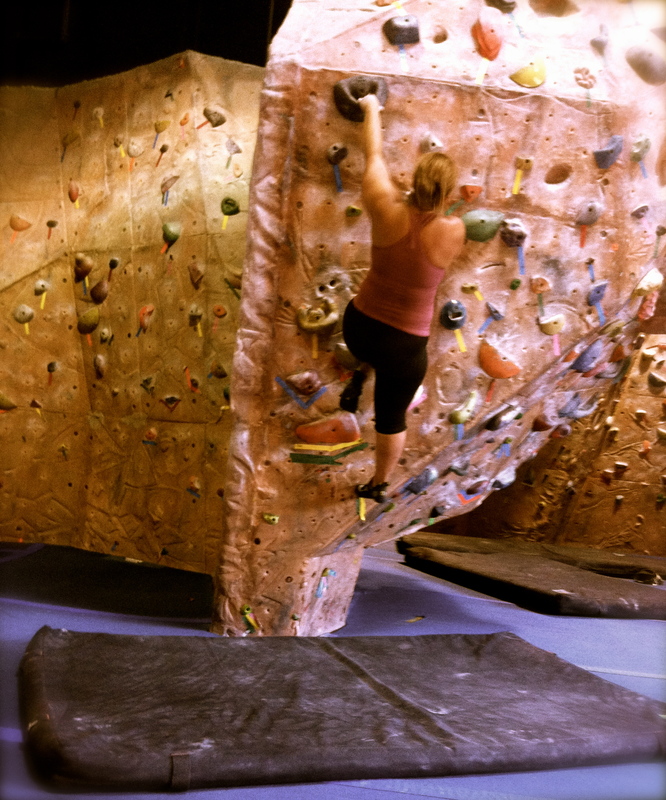 Climbing/Grades – I only had an opportunity to boulder and loved it. I was working on endurance, so I up/down climbed all the V0s through V2s in about 1 hour. I love it when even the V0s have tricky cruxes vs. an easy jug ladder. I did a walk through and looked at a lot of the top rope and lead climbs and they have a similar theme, very interesting and intuitive lines. I wish I would have set up a partner because the lines just looked so enticing, so VERY WORTH checking out this gym! All climbs are marked by colored tape. Bouldering grades are not marked at the start holds, all bouldering grades is identified by color and there is a huge board with the color codes and what grade it is. This was actually super easy to follow. 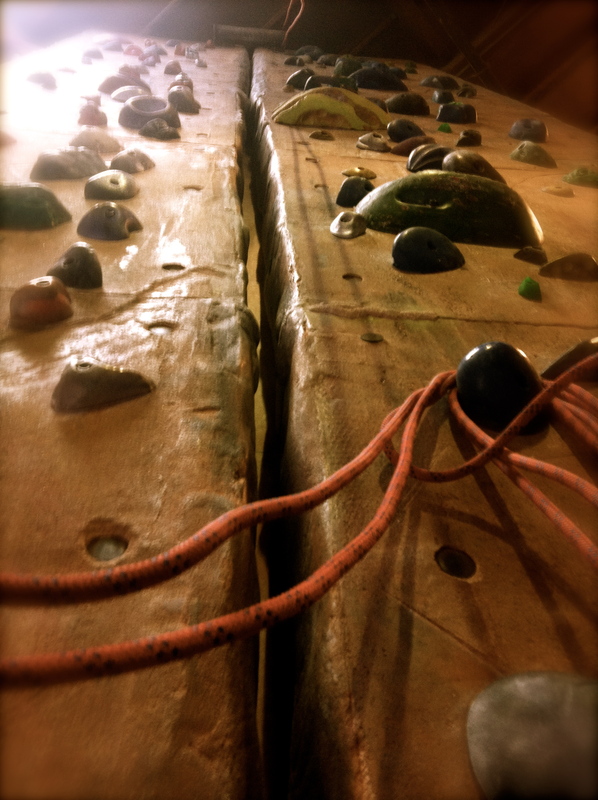 Top rope and lead routes are all graded at the start hold and 5.10 onward have the standard letter breakdown. I mention this because my home gym only uses + or – or the grade so 5.10+ rather than 5.10b for example. Personal Items – There are cubbies positioned in various areas of the gym, which is so nice. I bouldered and just stored my stuff right next to all the boulders in cubby. There are also lockers in the women’s bathroom for storing personal items. Friendly, inviting atmosphere, tons of really interesting and intuitive climbing routes and boulder problems, and a veteran gym that is close to 20 years in business (CONGRATS! ), why wouldn’t anyone go out of their way to pay this gym a visit? Next time you are in California, Irvine’ish kind of area or the cute beach towns (e.g., Dana Point, San Clemente, etc. ), make sure you visit Rockreation, start here http://rockreation-cm.com/.